THE STORY - After months have passed without a culprit in her daughter's murder case, Mildred Hayes makes a bold move, painting three signs leading into her town with a controversial message directed at William Willoughby, the town's revered chief of police. When his second-in-command, Officer Dixon -- an immature mother's boy with a penchant for violence -- gets involved, the battle is only exacerbated. THE GOOD - A timely and resonate message that results in McDonagh's most mature work yet. A fiery performance from Frances McDormand and a complex turn from Sam Rockwell leads a truly stellar ensemble all blessed with McDonagh's writing. THE BAD - McDonagh still has a tendency to add unnecessary humor which only serves to break the mood/tone at times. "Three Billboards Outside Ebbing, Missouri" is yet another showcase for Academy Award-winning playwright, director, and screenwriter Martin McDonagh to prove to the world that he may be one of the most underappreciated talents working within the industry today. With only three films under his belt (He also wrote and directed "In Bruges" and "Seven Psychopaths"), McDonagh now officially cements his name as one of the most vital voices in cinema with "Three Billboards." It is an angry film, filled with dialogue that punches you in the gut both comically and emotionally. It has a terrific ensemble that relishes in spewing McDonagh's dark dialogue. But most importantly, it contains a message that we need more now than ever as the quote above suggests. Taking place in Ebbing, Missouri (As the long title suggests), it has been seven months with zero arrests in the Angela Hayes case, where a teenage girl was raped while being murdered. Her mother, Mildred (Frances McDormand), has had enough of the police's lack of results and takes matters into her own hands by purchasing advertising (From Caleb Landry Jones) for three large billboards right outside of town. The signs say "Raped while dying & still no arrests. How come, Chief Willoughby?" Naturally, these provocative billboards anger the local police department headed by Chief Willoughby (Woody Harrelson), along with his men, including the beer drinking, loose cannon Officer Jason Dixon (Sam Rockwell). Mildred's decision not only angers the local police department but also leads to a series of events which has devastating consequences for all in the town, including her son Robbie (Lucas Hedges), her ex-husband Charlie (John Hawkes), Willoughby's wife Anne (Abbie Cornish) and more. "Three Billboards" is an angry film with an angry character at its center. We have heard or experienced that grief is a personal process. McDonagh's film shows what happens when "thoughts and prayers" aren't enough and we take that grief and put it into action. McDonagh's comment on how there is no justice in the world unless we make it ourselves is a tricky balancing act between hatred and anger versus love and forgiveness. It is this quality which makes "Three Billboards" stand out as McDonagh's most mature and best work to date as a writer. It also allows him to flex his directorial muscles as well. Shots of the billboards, sitting in the open field of fog, with a large countryside mountain of trees behind it, are absolutely beautiful in their haunting imagery. They are a painful reminder of one woman's grief and search for answers in a world that is so quick and eager to move on with their lives while another's is forever crushed. We've seen Frances McDormand give great performances before but not like this. In "Three Billboards" McDormand is a powder keg of anger, sadness, and sympathy. She has more than a couple of great moments of dialogue that will leave you cheering, laughing and seriously contemplating the difficult moral situation she has found herself in. To put it simply, if burning the whole world and every living person in it, meant that Mildred could bring her daughter's murderer to justice, she would do it. 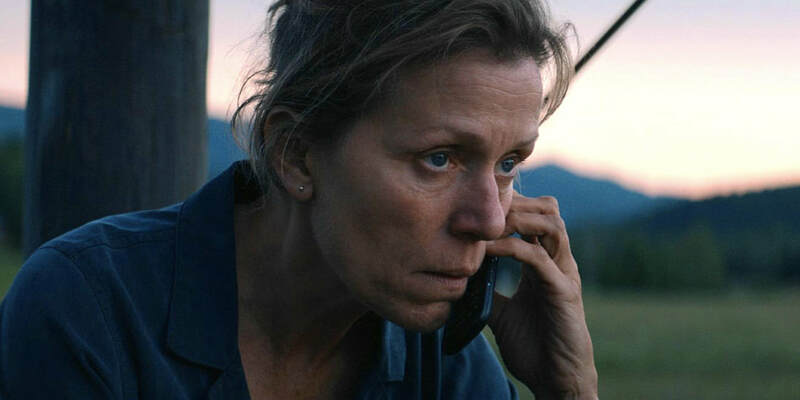 However, for every hole that is drilled into someone's finger, fire she sets with molotov cocktails, or kick in the balls she delivers, McDormand never forgets to allow us to see Mildred's humanity. Surprisingly, she is not the only one with a fully fleshed out character. Many thought that Woody Harrelson would be the supporting player who would also benefit from McDonagh's literary words on the page but its actually Sam Rockwell who benefits the most. As the not too bright and rage-fueled cop who still lives with his mom and struggles to do the right thing, this is the best Rockwell has been since "Conviction." A great deal of debt is owed to McDonagh's screenplay, which gives the character of Dixon a tremendously organic arc. Rockwell has always been great. He has always had the ability to raise a film's degree of quality simply due to his presence. But when given a juicy role such as this, the man is hard to resist. I suspect, he will finally get his long overdue first Oscar nomination for his heartbreaking work here. "Three Billboards Outside Ebbing, Missouri" contains many shots of the American flag at times. What I believed would be a comment on police abuse and brutality (Which it is), is more of a comment on our nation's lack of faith in humanity or perhaps it's about their confidence in humanity, depending on how you interpret the film's open ending. It tells one woman's story while positioning it as the front for a larger story about the cycle of hatred in our country and our world. It is easily McDonagh's most mature and brilliantly realized work despite one or two moments where his dark and unnecessarily vulgar humor threatens to hurt the tone of the film. These moments are few and far in between as McDonagh sticks the landing, ending the film and its characters in the right place and leaving the decision over how we're going to make the world a better place up to us.